"Every so often, a company changes our lives, not just with its products, but with its ethos. This is why, following Coca-Cola’s 13-year run at the top of Best Global Brands, Interbrand has a new No. 1 — Apple." With that introduction, Interbrand, a New York-based but global branding consultancy, announced on Sept. 30 a new leader atop its annual list of the most highly valued brands in the world. Coca-Cola had been No. 1 since this list began in 2000, but Interbrand noted of Apple: "Few brands have enabled so many people to do so much so easily, which is why Apple has legions of adoring fans." Coke wasn't just bumped to No. 2. The second spot now belongs to Google. "The company once described as a search engine has found its voice as a true leader of the technology age. Tech-savvy or not, anyone who has continuous, or even intermittent, access to the internet is aware of the brand, and likely a user of at least one of its numerous offerings." Apple and Google also were among the fastest-growing brands, increasing their values 28 percent (to $98.3 billion) and 34 percent (to $93.3 billion) respectively over last year's report. Interbrand had kind words for Coca-Cola. "An enduring classic that has evolved over its 127 years, Coca-Cola remains the most recognizable — and one of the most valuable — brands in the world. Guided by its 2020 Vision goals around innovation, focus, and creativity, Coca-Cola achieves impressive global presence through standout ad campaigns, bold design, digital savvy and a simple, universally relevant theme that weaves throughout the brand’s communications: happiness." Despite the drop in the rankings, the Coca-Cola brand increased increased its value 2 percent to $79.2 billion. 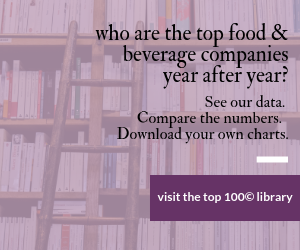 A handful of other food and beverage brands – the usual suspects – also made the list: Pepsi at No. 22 (also was No. 22 last year), No. 30 Kellogg's (was 29 last year), No. 31 Budweiser (formerly 31), No. 37 Nescafe (was 35), No. 49 Danone (was 52), No. 53 Heinz (was 46), No. 56 Nestle (was 57), No. 69 Sprite (formerly 66), No. 82 Johnnie Walker (formerly 83), No. 86 Jack Daniel's (formerly 81), No. 92 Heineken (formerly 92) No. 93 Corona (formerly 89), No. 95 Smirnoff (formerly 90) and No. 99 Moet & Chandon (formerly 98). The strength the brand has to command a premium price, or secure earnings for the company. "The brand must be truly global and needs to have successfully transcended geographic and cultural boundaries. It must have expanded across the established economic centers of the world, and be establishing a presence in the major markets of the future." The company also requires some public documentation of value, which is why it notes Mars Inc. brands are not on the list. More details are on Interbrand's website. Leads Interbrand list for the 12th straight year.